Because time goes by and is ever-changing, the Ice-Watch brand is adapting the classic look with its never-ending vitality. For him and for her. 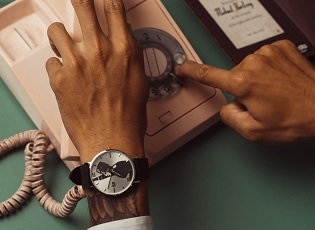 The result: a watch that adds class and character to your wrist. These very round stainless steel watches, curved from the dial to the mineral glass, are retro and trendy down to the very finest details. To sum it up, the ICE time always looks hot. For any time and any occasion, it oozes style in its 9 leather straps. Smooth leather and masculine, it combines black with 3 city browns. Soft nubuck and feminine, it comes in khaki, burgundy, beige, brown and black. 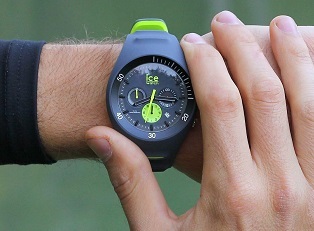 Colour, which is inherent to Ice-Watch watches, is also on show on the face and case! The men’s model is 41mm, steel and dons a black, caramel, silver or matt yellow coating. The numbers are simple and easy-to-read, spread out over a matt or bright canvas background. The range of tones means there is an ICE time for every look, whether business or casual: black, putty, white, silver, grey or blue. 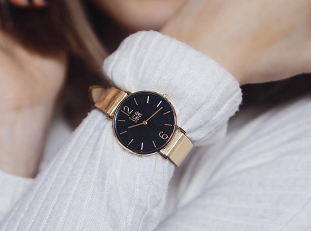 The women’s model has a matt case that plays with rose gold, chocolate and even violet colours! The face has only two numbers - 6 and 12 - adopting the minimalistic elegance it conveys from time to time. And it also comes in trendy colours! Colours à la carte: midnight blue, white, black, khaki, burgundy. The bright, golden pink, gold or silver dials add a luxury vintage touch. 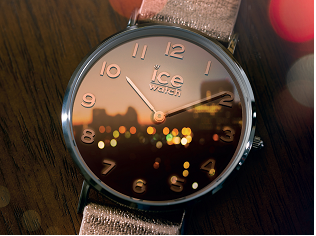 Perfect for all wrists, the ICE time woman comes in medium (38 mm) and small (32 mm) but with the same strap length. To ensure the perfect timing for each style, there are two shapes, two senses and two faces. 10 combinations for him and 13 for her: the ICE time sets the right time!